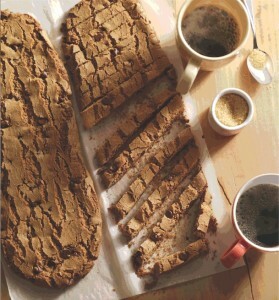 The recipe for chocolate chip sticks in the Kosher Palette cookbook became a standard in thousands of homes. Somehow, they came out differently for all bakers, with my friend Marisa’s being my favorite. This year for Passover, I tinkered with the recipe to use it on the holiday and my family declared that the cookies were so great, I “ended the suffering of the Jews.” I was so pleased to cut out white flour, that I have started making them this way all year round. Gluten-free people, rejoice! These cookies get a bit softer overnight. If you don’t like that texture, store them in the freezer. Preheat the oven to 350°F. Line a large cookie sheet with parchment paper. Set aside. In the bowl of a stand mixer fitted with the paddle attachment, combine the oil, sugar, and brown sugar. Mix well. Stir in the egg and vanilla. In a medium bowl, combine the quinoa flour, almond flour, potato starch, baking soda, and salt. Stir into the egg mixture. Blend well. Mix in the chocolate chips. Divide the dough in half. Place on the prepared sheet. Form the dough into 2 (3 x 12-inch) logs. Wet your hands if needed to manipulate the dough. Bake for 22 minutes or until golden brown. Cool for 10 minutes; cut while slightly warm into thin sticks.